Technology is being developed which can enable vets to identify if an animal is suffering from the early effects of a disease before it shows any clinical signs. The methods are increasingly non-invasive and results can often be provided within minutes. Once commercially available, these diagnostic tests could provide a cost effective means of guiding farmers to target treatment to affected individuals and to take measures to prevent the further spread of the disease. Moduleic Sensing technology makes use of unique DNA or RNA markers which can define different infectious diseases. They are present in samples including blood, saliva and milk and function like barcodes which can be recognised by Moduleic Sensing and then reported through an enzymatic reaction. Dr Andy Hall-Ponselè, founder and leading scientist at Biotangents, a biotechnology research company which has developed this technology explains why this diagnostic tool is potentially so valuable when detecting the first sub-clinical signs of infection. He says: “This test is versatile because the same device can be adapted easily to detect different target diseases. It is possible to use a distinct biological component within the device to detect the DNA in the different diseases. Dr Hall-Ponselè says they are initially focusing on the early identification of BVD and Johne’s disease because of the critical importance of both diseases. “If our test can help to reduce the prevalence of BVD or Johne’s, it can also help to limit the use of antibiotics because both diseases inhibit the immune system and lead to the more common occurrence of other infectious conditions. The test is designed to be used by vets because their clinical knowledge is required to interpret the results. Dr Hall-Ponselè says the device will be suitable for use on-farm and the results will be obtained on the premises, removing the need for blood samples to be sent to a laboratory and the time delay caused by this process. “The nature of this technology means it is far less invasive than a standard blood test because only a very small amount of blood has to be taken. A pin prick provides enough blood to run the test. “As the results can be given there and then, the necessary treatment or isolation of the animal can be implemented immediately, reducing the risk of the spread of the infection to other animals,” Dr Hall-Ponselè says. For more than two decades, the levels of certain proteins in blood have been used as a means to identify the presence of infection or inflammation in both companion animals and livestock. Known as acute phase proteins, they are a class of proteins where the plasma concentrations alter in response to inflammation or infection. Professor David Eckersall of the School of Veterinary Medicine at the University of Glasgow has been studying the levels of particular acute phase proteins in blood and more recently, milk, to identify the presence of sub-clinical disease. “We are currently focusing on developing a test for mastitis by measuring the levels of haptoglobin in milk. Haptoglobin is entirely absent from healthy milk but is readily detected in milk where the cow is suffering from sub-clinical mastitis. “Our research shows the level of haptoglobin in the milk reflects the severity of the infection,” he explains. Prof Eckersall’s research team is hoping to develop this test so a milk sample can be taken on farm and the results provided to the farmer immediately. He suggests the benefits of this would be wide ranging. 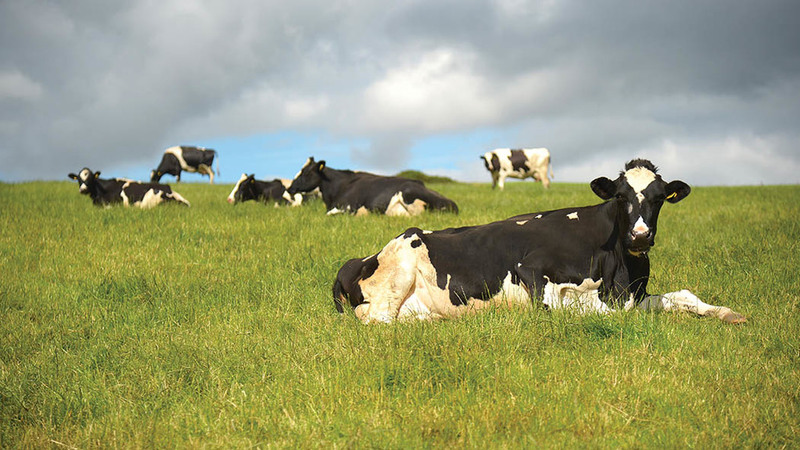 “Our test would allow vets and farmers to instantly and accurately identify cows which require treatment for mastitis and those who are clear of infection. Prof Eckersall says the levels of haptoglobin in blood can provide information about the general health of the animal as well as a specific disease such as mastitis when measured in milk. The measurement of acute phase protein levels in the blood, such as C-reactive protein in dogs, is becoming more widespread in the veterinary care of companion animals but it is still to be adopted widely in livestock. Prof Eckersall believes the slow take up of this diagnostic technique within the livestock industry is largely down to cost, as farmers cannot always see the economic benefit of performing such a test and the tests are not yet widely available. If the required procedure for the prescription of antibiotics becomes more rigorous in the future, diagnosis based on acute phase proteins could become more commonplace.